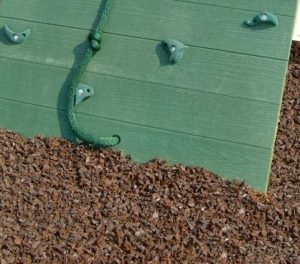 Rubber Mulch Playgrounds | Rubber Safe Playgrounds Inc.
Are you looking for the perfect material to put down on your playground? You’ll have plenty of options, including pea gravel, sand, and wood chips. Nevertheless, your best option, hands down, is rubber mulch. There are myriad reasons that make rubber mulch the right choice for playgrounds. Here is how it stacks up to a few of its closest competitors. If you’ve ever walked around on top of pea gravel, you know that it doesn’t provide very much in terms of shock absorbance. Therefore, if kids happen to fall down on your playground and land on pea gravel, there’s a good chance they’ll get hurt. This won’t ever be a problem with rubber mulch. Rubber mulch is soft and springy and will provide more than enough shock absorbance for kids to keep them safe in the event of falls. When you first have sand installed on a playground, it’ll feel soft and provide kids with fall protection. But over time, the sun, the rain, and the other elements can cause sand to become very hard and compact. As a result, it won’t offer much fall protection after just a few months. Sand can also be very messy and can even lead to bacteria growth on your playground. You won’t have to worry about any of these problems popping up when you use rubber mulch. When you first have sand installed on a playground, it’ll feel soft and it will provide kids with fall protection. However, over time, the sun, the rain, and the other elements can cause sand to become very hard and compact. As a result, it won’t offer much fall protection after just a few months. Sand can also be very messy and can even lead to bacteria growth on your playground. You won’t have to worry about any of these problems popping up when you use rubber mulch. Wood chips were the go-to material for playgrounds for many years. Nonetheless, a lot of playground owners have started to move away from them for many reasons. For starters, wood chips can cause kids to sustain painful splinters and offer very little shock absorbance once they begin to become compact. They can also rot and decay over time and blow away or get washed away by rain, which will force you to replace them regularly. These are issues that won’t ever come into play when you have rubber mulch installed instead. There are many benefits you’ll enjoy with rubber mulch that you won’t get with other materials used on playgrounds. Call Rubber Safe Playgrounds at 630-330-6589 today to get a free quote on rubber mulch.